Counter-serve chain with smoked-meat plates, sandwiches & chili, plus a college-football theme. 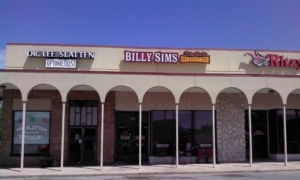 ​BBQ chain eatery featuring house-smoked meats, stuffed baked potatoes & classic sides. ​Low-key joint for BBQ classics including brisket, chopped port & St. Louis-style ribs, plus sides. ​Brisket, ribs & sides served up cafeteria-style in a no-frills setting with indoor picnic tables. Oklahoma-based barbecue chain dishing up ribs, brisket, sandwiches & sides in a laid-back setting. 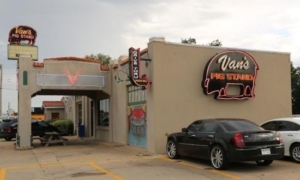 ​Van's Pig Stand has been a Vandegrift family tradition since the 1920s with locations throughout central Oklahoma.